Unfortunately asthma is a part of life for my little man. He's pretty good about telling us when he needs to have a treatment (though when he is gasping for breath between coughing fits, we kind of get the picture). 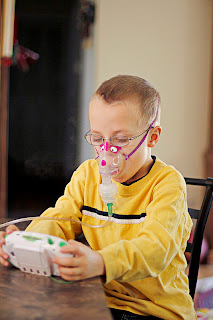 We usually end up in the ER atleast once a year for Jaxon's asthma, though thankfully (knock on wood) we have done pretty good so far. I don't think we ended up in the ER last year (2011) and hopefully we'll keep out of the ER this year as well.